This photograph shows an exterior view of the Kirby Building in Howard, Kansas, with the Kasson Drug Store in the building. A grocery store is partially visible to the left, and a store for school books, supplies, paints, oils, wallpaper, window glass putty, varnish, and jewelry is visible on the right. 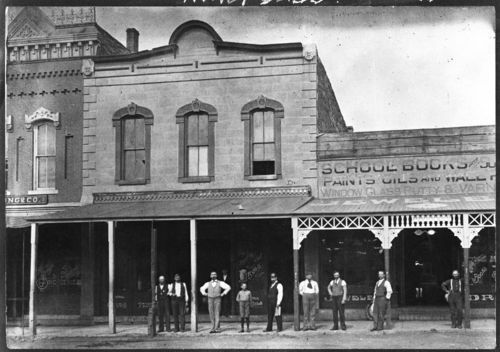 Several men and a boy are seen posing for the photograph in front of the stores. The Kirby building later burned. Holding Institution: Henry Bennett, 1972.